Address: 289 Livingston St, Bklyn NY 11217. Enter your name and email to get our report "10 Tips for Making Your Child's Birthday Party a Huge Success". And get all of our birthday party info including prices & schedules and FREE invitations for your party. Do You Want To Give YOUR CHILD A Birthday Experience That They Will NEVER FORGET? If this is what you want (and who doesn’t want to give their kids the perfect birthday party? ), then you will love what you are about to see! NOW, Learn More About The Birthday Experience That Your Child’s Guests Will BE Talking About FOR MONTHS!!! Instead of just dropping the kids off at some game center, and letting them run wild all day, Do Something Different. 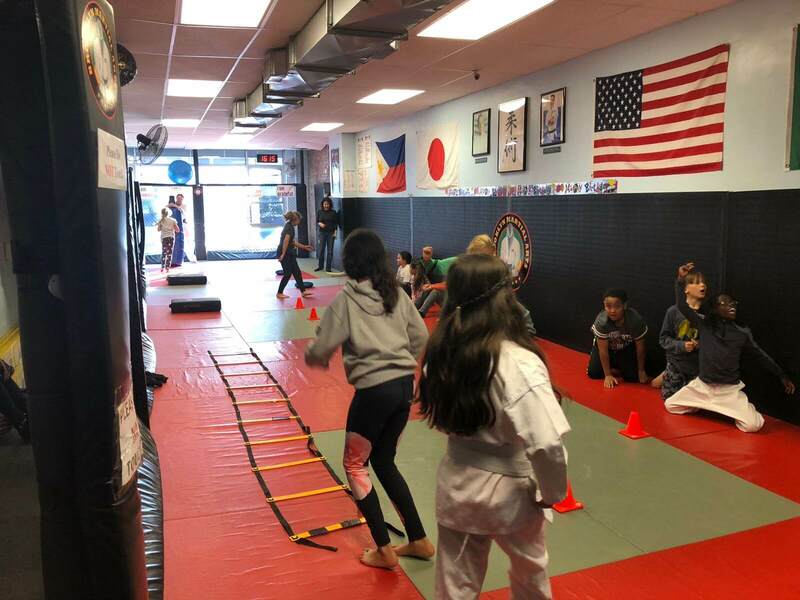 Let us give your child and their friends a Fun, Structured birthday event at our Martial Arts Training Center that their friends will be bragging about for months! Take a look at what’s in store for your Birthday Youngster when you give them the Brooklyn Karate Birthday Party. 2 hours of completely supervised Excitement and FUN! Relax and let us chaperone and supervise the kids, OR stick around and join in the fun. Grown ups always have a good time at our parties. It includes a Huge Pizza Party for your kids, followed with ice cream and birthday cake! Plus we include plenty of extra pizza for the Parents and Staff to join in the fun! An awesome cake-cutting ceremony where your child will cut the cake WITH A REAL SAMURAI SWORD!! We closely supervise this, and it is 100% Guaranteed to make Your Child feel like the coolest kid in the Universe! Want to play with the kids? There are plenty of opportunities for parents to be involved in the event, and all our activities. Want to relax instead? Let us take care of everything for you! Either way is great by us! This party is for 15 children, and it’s a great time that doesn’t get too out of hand! Activities! Challenges! Non-stop games! Plus all the kids will learn some Martial Arts while they are at it! And here is the Awesome Part! When we are giving the kids some Martial Arts instruction, guess who will be up at the head of the class with us? Your Child! Believe me, they are going to feel like a Total Champ! At this party, your child will be the hero. They’ll showcase their Martial Arts skills, and feel like a total Rock Star! During the festivities, we’ll show all the kids some basic Martial Arts techniques, with the Birthday Boy or Girl helping us teach! 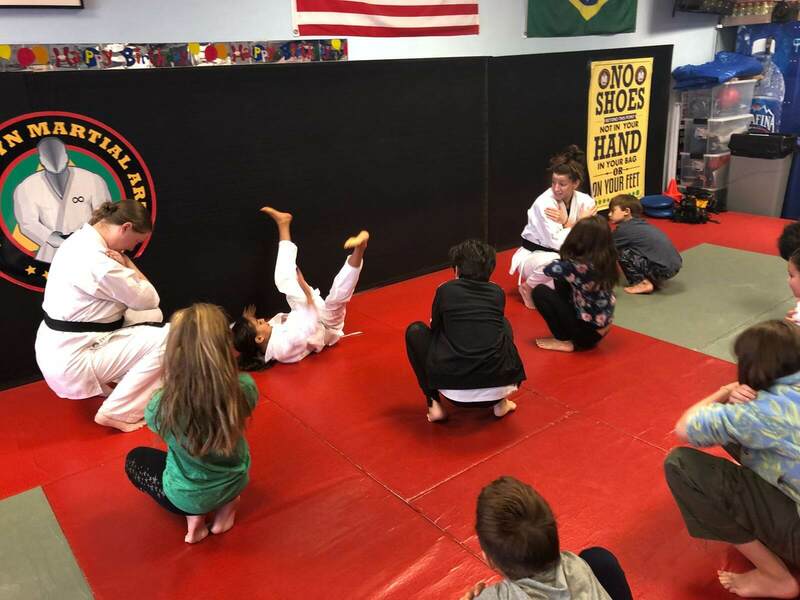 If your child has reached the appropriate level of training, we’ll even have them Break a Board in front of ALL Their Friends!! All the kids will be completely impressed with how much they’ll learn at the party. They’ll be talking about it for weeks at the least, and many of them that aren’t already studying Martial Arts will probably start! All this positive feedback from their friends will skyrocket your child’s self-esteem and confidence. They will feel so proud of what they’ve learned, and what they’ve accomplished. The shocked expressions on their friend’s faces, and their compliments, will highlight for your child just how much they’ve progressed in their training! Check out what we’ve heard from satisfied happy parents just like you! “It’s been 2 weeks since our son’s party, and he just won’t stop talking about how cool it was! He and the boys ahd a great time and believe it or not, I think we may use guys for his birthday next year! He’s already told us that’s what he wants. Between showing off all the moves she’s learned…slicking the cake with a real sword…and helping her friends to learn some basic moves too... Emily felt like she was on top of the world.I’ve never seen her smile bigger. We’ve done all kinds of parties for Amanda. Most of the involve the kids running around screaming like banshees and laughing and going crazy. It’s safe to say that I get a good night’s sleep after those parties – because I have to run around making sure they don’t hurt themselves! However, your staff was extremely supportive and trustworthy. I felt like I could really relax and enjoy myself. The kids really respect and listen to you guys, which made it very easy on me! I HIGHLY recommend this to all parents! You and your child will love it! Connor has been waiting for a long time to show hs friends everythying he’s learning in Martial Arts. He tells them about it – but he’s never been able to really show them. Well, his friends were totally blown away when they saw how good he is! They all congratulated him and he was just beaming. That alone make this party worth it. At the zoo or the game center, for your child and 15 of their friends, you could easily pay $550 or more! BUT, there wouldn’t be any close supervision, because that’s up to you and the other parents. Plus – this party is Way More FUN!! 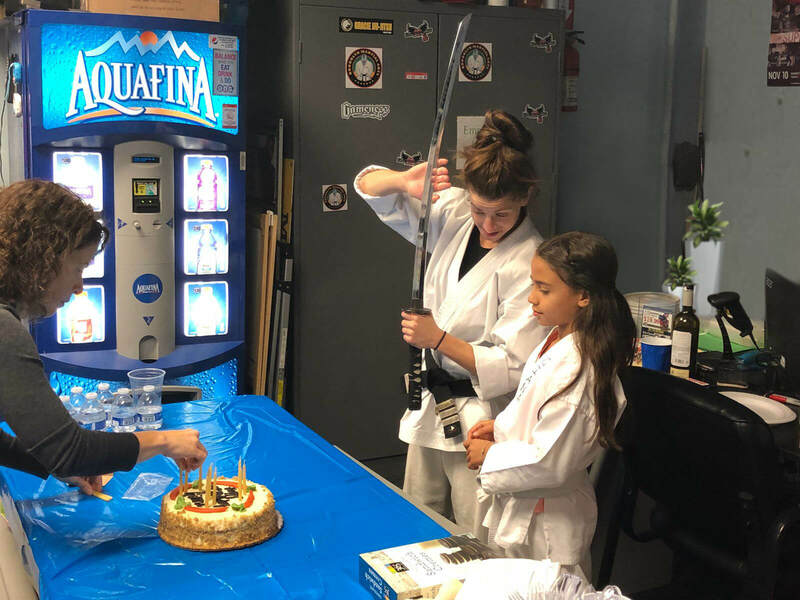 Choose Your Brooklyn Karate Birthday Party experience! 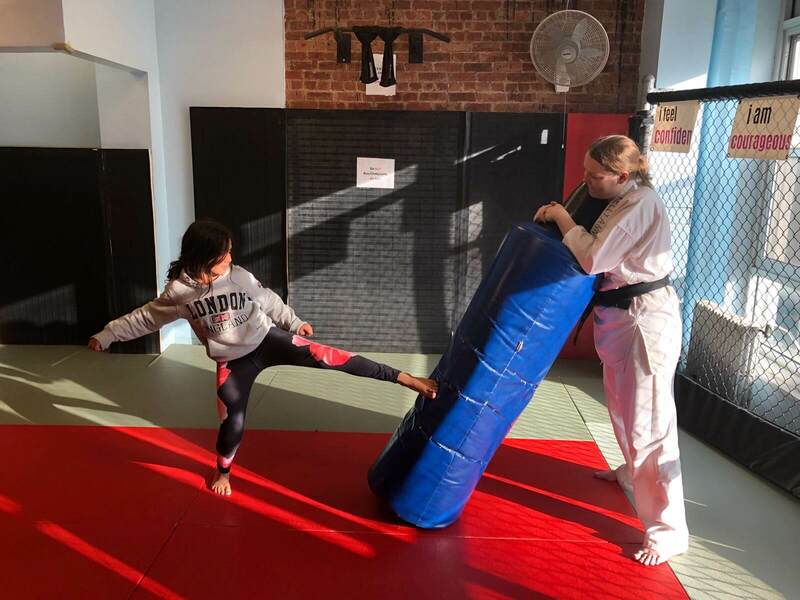 Standard Brooklyn Karate Birthday Party Cost: $399 2-hour party for up to 15 kids, including plates, napkins, utensils, pizza, and beverages Guests will participate in martial arts games and activities. Our instructor will assist the birthday boy/girl in cutting the cake with a real samurai sword! Board-Breaking Extravaganza Brooklyn Karate Birthday Party Cost: $499 Same as Option A, plus… Our instructor will teach the birthday boy/girl and guests how to safely break real wooden boards! Custom Theme Board-Breaking Extravaganza Brooklyn Karate Birthday Party Cost: $599 Same as Option B, plus… Custom-themed party supplies and decorations, for example Power Rangers, Kung Fu Panda, etc. Our parties are So Popular that most kids end up having their birthday with us 3 or 4 times! That means that our dates book up fast, so Don’t Wait! Schedule YOUR CHILD’s Big Event! We’ll gladly answer all the questions you have, and get your child all signed up for their Biggest Birthday EVER! !